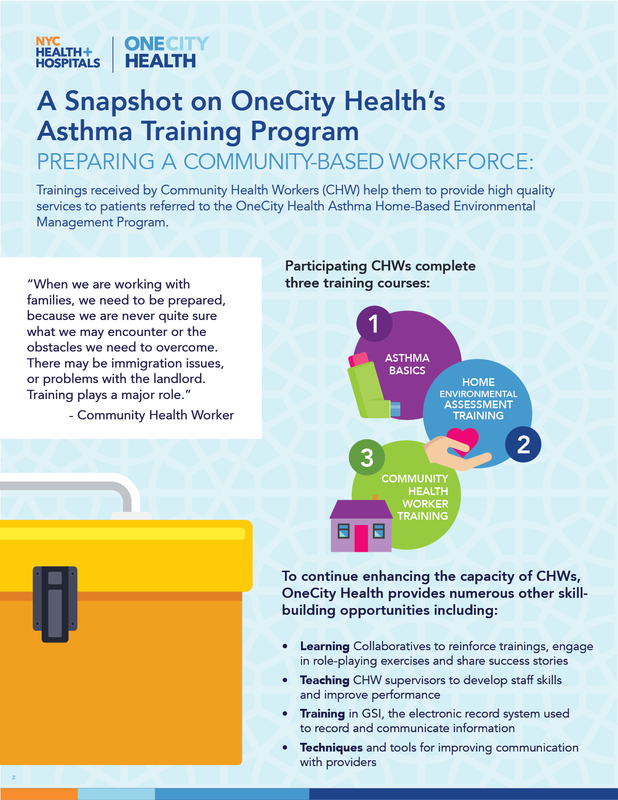 Through OneCity Health’s asthma home-based environmental management program, Community Health Workers (CHW) are helping pediatric patients and their families to manage asthma and identify home triggers. This initiative requires a well-trained and prepared CHW workforce, capable of extending care and other services into the community where it is needed most. While Community health workers provide a wide variety of services to the community, they often have limited access to affordable, high-quality trainings and certifications that can provide them with the added knowledge and skills work at the top of their scope. In fact, many OneCity Health partners reported that CHW trainings were difficult to find in the community, and the cost was too prohibitive for most CHWs and their organizations. To ensure that high-quality services are delivered to patients, OneCity Health developed a comprehensive, required training program and ensured CHWs could complete the program free-of-charge. These trainings enabled them to provide high quality services to patients referred to OneCity Health’s asthma program. De La Cruz’s work has made a major impact on families.